Not sure. I picked up this bike 2 months ago from someone. I think it has 2 previous owners (to my knowledge). The VIN # states it’s a 1200. Someone has installed S&S pushrod kit and some kind of aftermarket valve springs (my bike has 3 springs on each valve instead of the factory 2). Need to check if I have S&S cams too. So it’s possible these jugs are aftermarket. I just would like to know what brand or what the symbol is/means. I think that is a "Graphic symbol" for an A. I've seen it before but can't remember where. 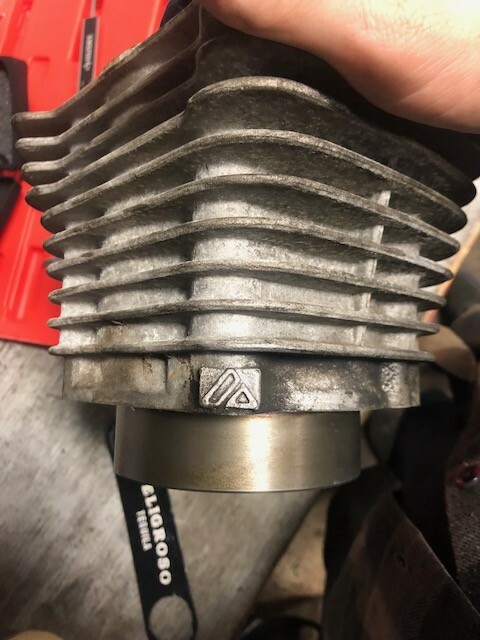 I emailed a photo of my cylinder to my local HD dealer. They researched it, and turns out. Its a Drag Specialities jug. They said I should I should get drag specialities gaskets, but I had already ordered the Cosmetic gasket kit for my Top end rebuild. Hope the gaskets are fine. I knew I'd seen that symbol before, glad you got it figured out. There's a company that imports a ton of "replica" products from Taiwan, who then sells to distributors. In some cases the products they bring in are sold under private label deals. So the distributor puts his sticker on the box and then sells to dealers as his own branded product. That's what this product is. It's sold under four different brand names that I'm aware of, possibly more. Drag is one of those companies. You can go buy the exact same cylinder from V-Twin or Custom Chrome, for example. I've also seen it branded as a Sifton product. The company that imports it keeps a low profile, and won't sell to dealers. They're an importer and they sell to distributors only. Just figuring out who they were was difficult. It's a pretty well made cylinder, too. It used to be a good lower-cost alternative to the factory piece. But now it costs almost as much as a new cylinder from HD, at least at the retail level. Popular with Indy shops who would rather buy a cylinder from their distributor with good margins instead of buying parts from an HD dealer at a jobber price. Good job researching that foundry mark!